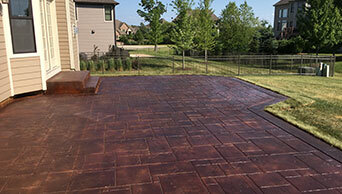 Stamped concrete is concrete that is patterned to resemble brick, slate, flagstone, tile and even wood. Stamping transforms ordinary concrete into spectacular hardscapes. 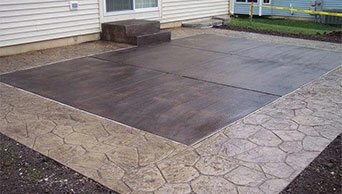 Stamped concrete is an excellent choice for driveways, patios and sidewalks. Colors and patterns for stamped concrete are often chosen to blend with other stone or tile exterior elements at your residence. Henson Concrete Construction, can provide you with complex designs, incorporating steps and borders to achieve your desired look. 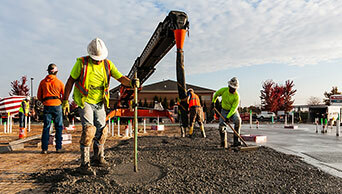 Work with our experienced concrete designers to find the style and shapes that fit your needs. What was once cold and gray can become warm and inviting. What was once bland and boring can become fresh and artistic. What was once "just concrete" can now become the floor of your dreams. Henson Concrete Construction's acid-etched staining of concrete produces a unique look for your floors that guarantees no two will be the same. Your existing concrete floors can become elegant, multi-dimensional customized surfaces resembling the look of fine marble or soft leather. Applying several coats of sealer and hardeners will produce a high gloss finish. The staining of concrete is an excellent option when finishing your basement or when you want to give your garage floor a unique appearance.